Work has been riding me pretty hard of late and so I haven't had a chance to do much reading, and when I have it has been non-M&M stuff. I'm hoping to get back into the swing of things in the coming weeks and get some reviews up for both the Gadget Guides and some other RPG items. Work attacked me with multiple Affliction attacks and I took a Staggered condition as a result. I'm hoping to make a successful resistance save to overcome soon however. Let me know if you need me to pitch in with an Aid action. Down, but not entirely out. That about sums up the last month. Hopefully things will let up soon (or maybe I'll win the lottery). I'm going to try and tackle some of the Gadget Guides soon, I swear. In the meantime here are two more reviews on the non-M&M side of the RPG world. A short fiction anthology tied into the forthcoming Numenera game from Monte Cook. A free download of maps originally used for Ptolus. This is great for people who like maps for their sessions though as these are 1) Free and 2) varied enough that you could use them for a variety of games. Jameson I have to agree with you about the Archaic weapons guide. It was pretty disappointing. weapons presented in the rulebook. Armor's table is basically the same as the core book. The discussion of armor types does offer a small range, and suggestions of other types of armor at that range. E.g. Chain mail gets a +1 when you add a cuirass/breast plate, and is generally in the same range as scale or lamillar armors. I'm ok with that though, as I don't need a "x type of armor is exactly y rank of protection" I prefer the "use this effect to get this result" type of discussion, which I feel armor delivers and the archaic weapons (and asian weapons) did not. 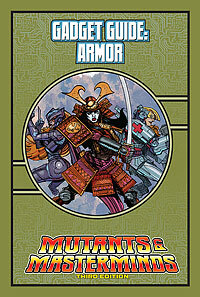 Jameson wrote: Armor's table is basically the same as the core book. The discussion of armor types does offer a small range, and suggestions of other types of armor at that range. E.g. Chain mail gets a +1 when you add a cuirass/breast plate, and is generally in the same range as scale or lamillar armors. I'm ok with that though, as I don't need a "x type of armor is exactly y rank of protection" I prefer the "use this effect to get this result" type of discussion, which I feel armor delivers and the archaic weapons (and asian weapons) did not. Cool, thanks for the info. It sounds like gadget guide armor is a lot alike gadget guide energy weapons. unique. So a large armor chart isn't really as necessary as I thought it would be. I've got 4 more Gadget Guides that I need/want to review: Guns, Heavy Weapons, Energy Weapons, and Vehicles. Right now I am thinking of reviewing them in that order, possibly with the first 3 as a single review (or maybe a review for Guns and a 2nd for the other 2). I'm looking for feedback from the audience here though, do you all have one you want to see sooner rather than later? Edit: Since Gadget Guide: Mecha was released today and Pacific Rim comes out Friday I plan to review that next and then tackle some more of my back log. I'm still open to feedback about which of those to do next however.